I can’t believe there’s been only one lentil recipe on Cook Smarts so far. Now that’s what I call a travesty. I’ll fix this oversight today by sharing this super simple and healthy mustard roasted fish and lentils recipe. This meal is something you’d find at a fancy schmancy French restaurant for well over $15 / plate, but I’m going to show you how to replicate the same results in your own kitchen. If you’ve never worked with lentils, they’re a great ingredient that just about every dietary group can enjoy. They can take on a lot of different flavors and are also full of fiber and protein. I keep both dried green or French lentils, which are almost black in color, in my pantry as they’re my favorites for flavor and texture. I’ll soak them the night before or the morning of cooking using a 3 to 1 water to lentils ratio. This short little step will significantly cut down amount of time it takes to cook them so is completely worth a bit of planning. I love them paired with many different types of vegetables and proteins but a simple roasted fish seems like the perfect French choice. Today’s roasted mustard fish recipe is adapted from the Barefoot Contessa and uses classic French flavors – capers, mustard, shallots, thyme, and creme fraiche – to create a simple sauce that cooks with the fish. The result is an incredibly tender fish dish that pairs perfectly with our al dente lentils. 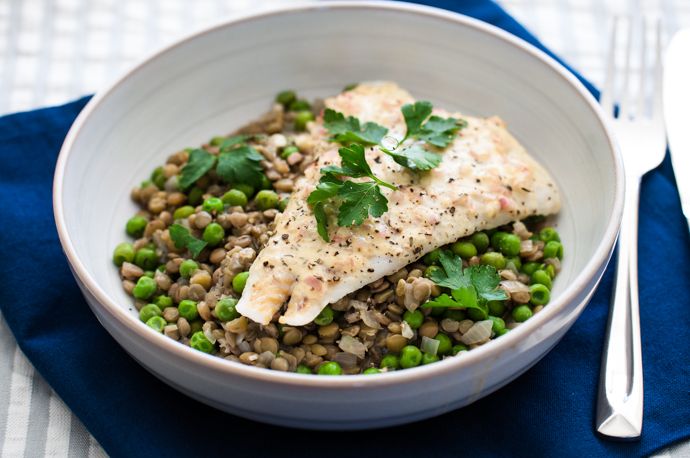 This fish and lentils dish is something you’d find at a fancy schmancy French restaurant for well over $15 / plate, but I’m going to show you how to replicate the same results in your own kitchen. Dried thyme – 1 tsp. Baby spinach – 4 oz. Shallots, minced – 2 tbs. Dried thyme – ½ tsp. Capers (opt) – 1 tbs.